I have written several articles on the shale gas controversy. 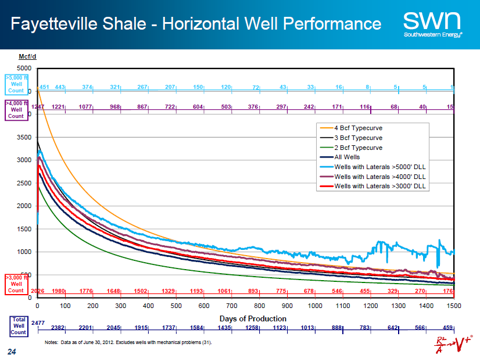 In my last article, I analyzed the real decline of Fayetteville shale wells operated by Southwestern Energy (NYSE:SWN). I decided to do more data analysis after I read SWN's detailed investor presentation. I post this article here on my Instablog because SA decided that they would not accept any more of my articles for publication. Sad! Is Natural Gas Cheap and Abundant? There is a common myth within the investment community that the new horizontal drilling and hydraulic fracturing technologies opened the door for cheap and abundant natural gas (NYSEARCA:UNG) from shale. An NG supply glut since late 2011 pushed NG prices to decade lows, yet there was few sign that producers were cutting production in any significant way. This further supports the general consensus that at least some producers believe they could still make a profit at the record low gas prices. Can shale gas really be produced cheaply as some claims? This question is critically important to coal investors. At a price of $3.00/mmBtu or lower, NG competes with coal for electricity generation. If NG producers can make a profit producing shale gas at $3.00/mmBtu, then the future of coal looks dim. On the other hand, if NG producers can only make a profit at much higher gas prices, then the current depression in coal prices is only be temporary. This would mean there is a great opportunity to invest in the coal mining sector now. 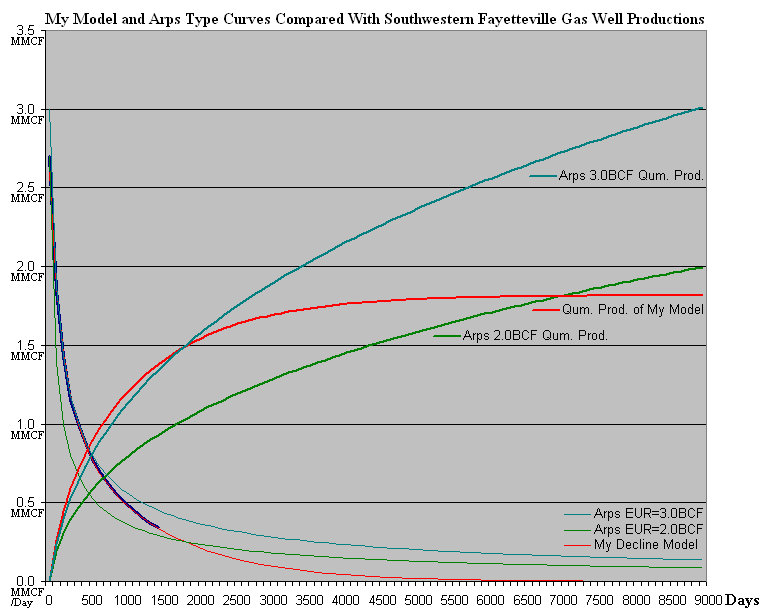 My study convinced me that shale gas is non-economical unless the gas price goes much higher. Let me speak with data and facts. SWN claims to the lowest cost shale gas producer in the industry. They operate mostly in Fayetteville, a shale play of low drilling cost due to shallow depth of the shale. Let's find out what is their real production cost of the shale gas. The EUR (Estimated Ultimate Recovery) per well. Some NG producers provide well cost numbers. Always take their numbers with a grain of salt and ask: What costs were excluded? SWN gave per well cost of $2.8M in 2011. They spent $2.2B in capital spending and completed 560 Fayetteville wells in 2011. $2.2B divided by 560 is $3.93M. So I think the real cost per well was $4M. In the bigger picture, the top 40 NG producers spent roughly $128B capital spending in 2011. There were 16,000 wells drilled. So the industry wide average drilling cost was about $8M per well. 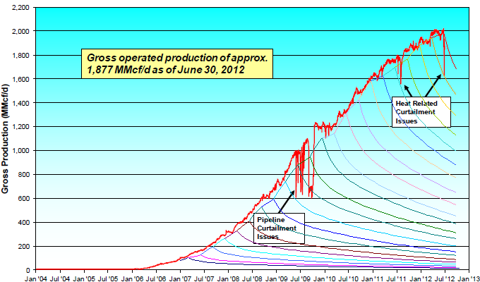 All shale gas wells are in continuous decline once they were brought into production. So estimating EUR is a matter of trying to project the production decline. 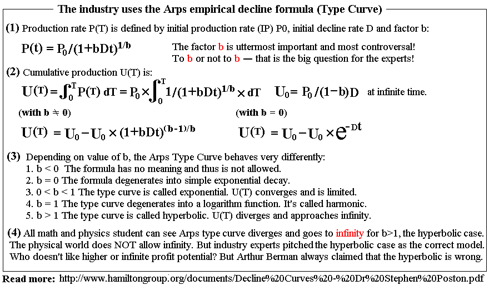 The industry uses the Arps formula to calculate EURs. Critics like Arthur Berman pointed out that the formula was never confirmed to be working in hydraulic fractured wells. 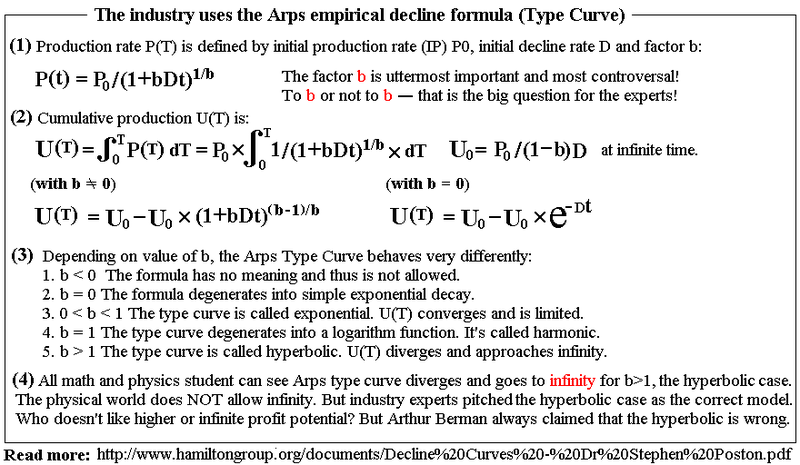 The formula, when used with a high b-factor, often leads to grossly over-estimated EURs. A good example is Barnett Shale. Chesapeake Energy (NYSE:CHK) projected an EUR = 2.65 BCF using Arps formula. But after decades of development and 70% of the core area of Barnett already drilled, the cumulative production per well is only 0.663 BCF. That's only 1/4 of the projected EUR. I discussed my decline model previously so I will not elaborate here. 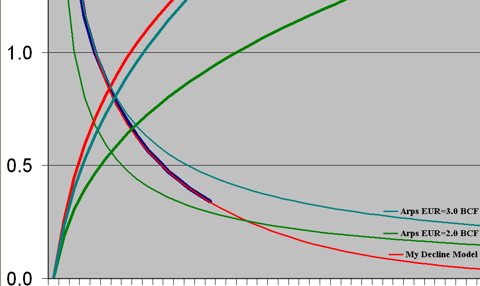 With an IP = 4.0 MMCF/Day, my model predicts an EUR of 1.75 BCF. So the EUR is rough 438 days or 1.2 years worth of IP production. My data model is validated! So let me calculate the EUR per well. 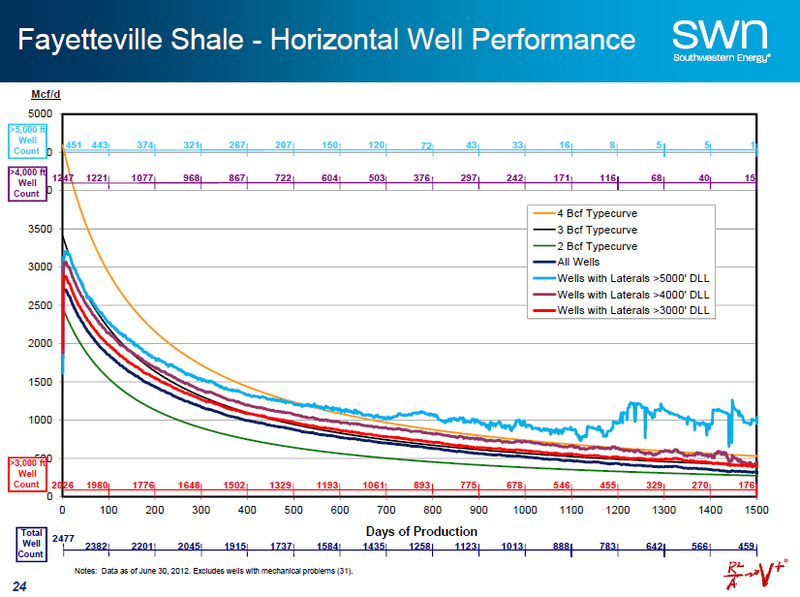 Based on the SWN well chart, the average IP = 3.125 MMCF/day. As explained, EUR is approximately 438 days worth of production at IP rate. So EUR = 438 days * 3.125 MMCF/day = 1.37 BCF/well. This number is way below what SWN believe their EURs are. But my number is consistent with my last estimate. 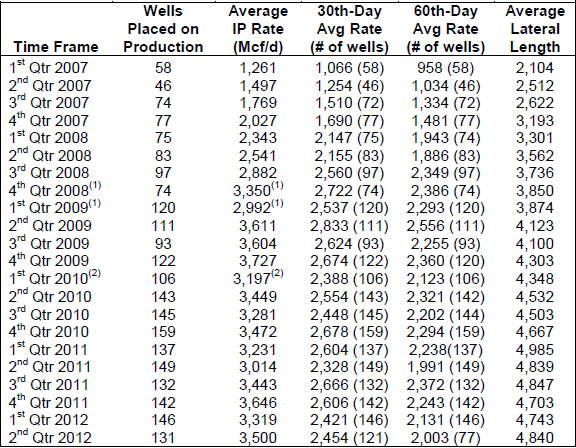 In previous article, I argued that 1.56 new wells a day is needed to maintain a flat 1.95 BCF/day production. So one well is worth 1.95 BCF/1.5 = 1.25 BCF. What is the Real Cost of Fayetteville Shale Gas? If my numbers are right, we are talking about each well costs $4M from drilling to completion. It can produce 1.37 BCF in its lifetime. The well cost of the gas is $4M/1.37BCF = $2.92/mmBtu. On top of that, SWN reported $1.13/mmBtu of finding and development cost, and $1.20/mmBtu of cash and operating cost. 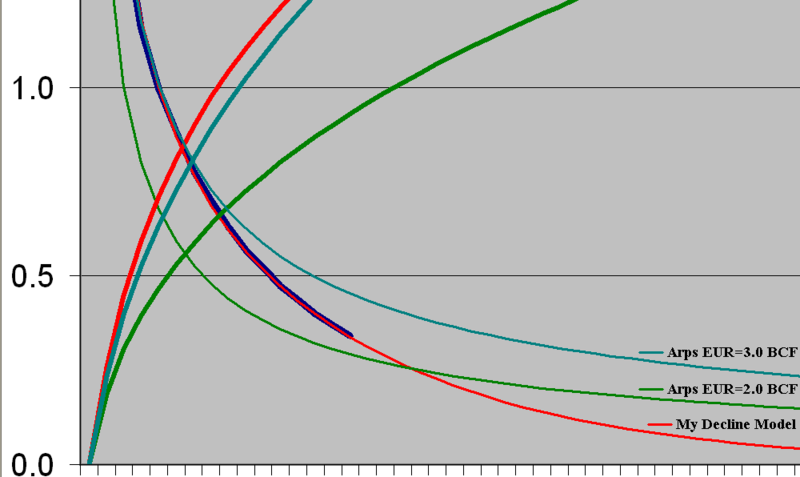 But SWN calculated its F&D cost based on inflated EUR. Adjusted to realistic EUR, I think the F&D cost should double to $2.26/mmBtu. The total comes to $2.92 + $1.20 + $2.26 = $6.38/mmBtu. That is the real cost of producing from the Fayetteville, the cheapest shale. "To put into perspective how ridiculous Chesapeake's claims of 2.6 Bcf is, consider the following: of the company's 742 operated wells completed on the Fayetteville, only 66 have produced more than one Bcf and none have produced more than 1.7 Bcf. Chesapeake's average Fayetteville well has produced only 541 Mcf." 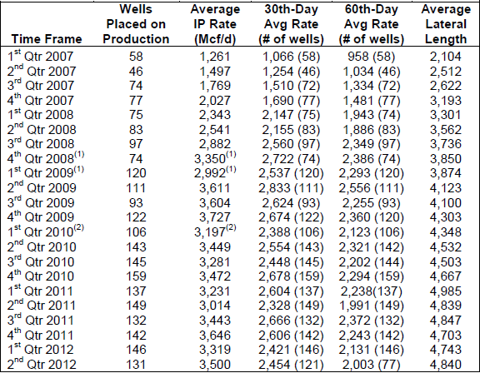 These numbers are in huge contrast to the rosy numbers that NG producers have been selling to investors over the years. Wake up, people! The NG industry have spent more than half a trillion dollars over the decade to develop shale gas. 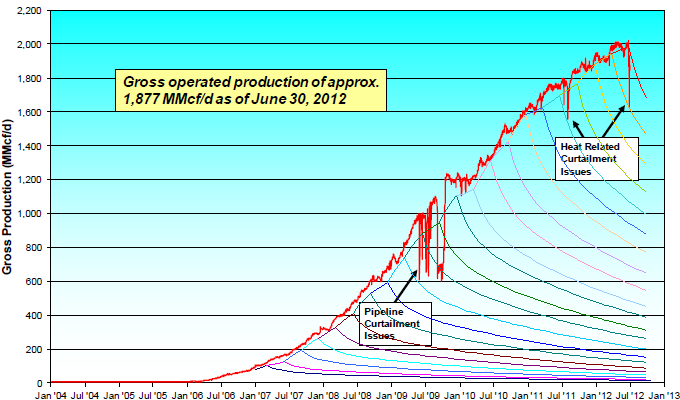 So far they drilled 36,000 wells and produced 23,000 BCF of shale gas. That averages $13.9M per well and $21.74 per mmBtu of gas produced. 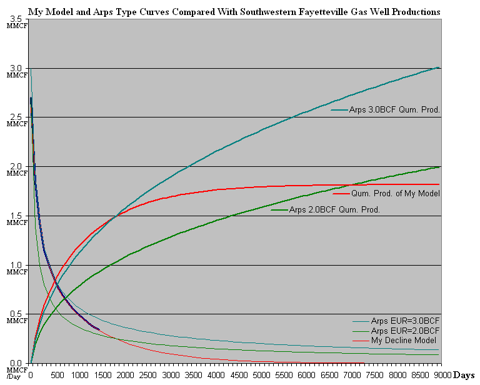 Shale gas is neither cheap, nor abundant! My conclusion is that energy investors made the biggest mistake in energy investment history, by placing 75 times more investment capitals in the NG sector, than in the coal sector. This happened because of the wide-spread myth that natural gas has become cheap and abundant, and that we are seeing a paradigm shift away from coal. The myth is false. It is not supported by data and facts. This creates one of the biggest investment opportunity today. My advice is get out of the NG sector and get into the coal sector. If I have to pick an NG producer that I like, I have to pick one which has low debts and low costs. After looking at the data, I like SWN best. They have relative low debt load. They have the lowest cost in the industry. Gas price has got to go much higher. SWN should be among the first to benefit. Disclosure: I am long ANR, ACI, JRCC, BTU.